The Sukuyō-dō 宿曜道 (literally, the 'Way of Constellations and Planets') was an influential tradition and lineage of Japanese Buddhist astrologers (sukuyō-shi 宿曜師) who were primarily comprised of monks specialized in casting horoscopes and carrying out relevant astral magic to divert or enhance planetary influences based on the charts they composed. Their history has been studied to some extent in Japan, but the research is relatively limited and arguably largely unread. I am unaware of any detailed studies in English. I think this is partially due to the taboo and bias against astrology in modern academia, both in the west and east. Modern science has completely and often vehemently rejected astrology. Although the study of astrology has its place especially in religious studies, in Buddhist Studies to date it has not been so widely examined or discussed, or at least not to the extent Buddhist philosophy, abhidharma and meditation have been researched, even though astrology was equally influential. Astrology of course was alien to Buddhism initially and was actually rejected by many in the early Buddhist community, but as I have discussed on this blog for some time now, astrology was quite significant in Buddhist history. According to a strict scriptural understanding, there really should not exist a 'Buddhist astrology' given how it is forbidden by the Buddha in the vinaya literature and furthermore refuted in some sūtras. Nevertheless, it did exist and many Buddhists in India and elsewhere incorporated it into their practices and literature. A paper of mine awaiting publication entitled “Occidental Astrology and Buddhist Ethics in China 150-1150” addresses this issue, especially as it relates to Chinese Buddhist history where occidental astrology (i.e., astrology from outside China, not native Chinese astrology which is different) flourished, especially after the late eighth century. Japanese Buddhism likewise took up this interest and also developed a unique tradition devoted to it. The Sukuyō-dō originated in the late tenth century (the mid-Heian period) and vanished in the fourteenth century, existing alongside and often competing with the Onmyō-dō 陰陽道 (the 'Way of Yin and Yang'), who constituted another community of occult specialists deriving their tradition largely from native Chinese lore, divination and sorcery practices. The Onmyō-dō is a better researched tradition, but also has received attention in film and television in Japan. They also arguably had more influence in Japanese history, being skilled occultists both feared and respected by elites in medieval Japan. The Sukuyō-dō likewise catered to the elites, but it seems they were employed for the casting of horoscopes and their apotropaic astral magic. Such skills were desired, but ultimately the Onmyō-dō were better suited to the needs of an age of constant civil strife and warfare. While the Sukuyō-dō was recognized as a lineage, they did not possess sect-specific doctrines and often had differing views, which was unlike other Buddhist sects such as Shingon, Tendai, Kegon, Rinzai and so forth. It also seems that they were never highly organized or even that numerous. Although nominally monks, the lineage relationship between master and disciple in many cases was actually that of father and son. They could also belong to differing monastic institutions and sects. They were effectively monks specialized in astrology and their transmission of knowledge was recognized as a lineage. Although sukuyō 宿曜 has been assumed in some modern scholarship to refer to Amoghavajra's Xiuyao jing 宿曜經, in Japanese Sukuyō-kyō (T 1299; compiled between 759–764), the text was actually secondary to the tradition. 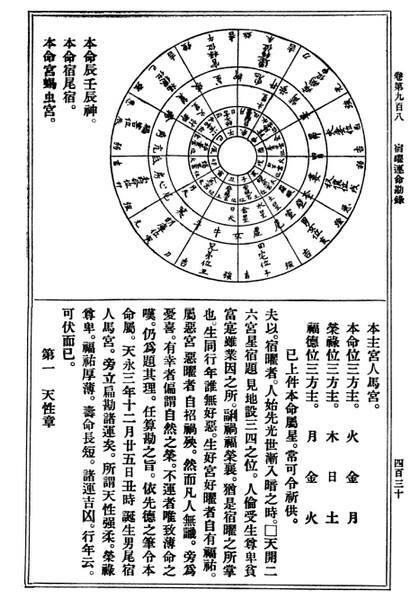 It drafted natal charts (horoscopes or sukuyō kanmon 宿曜勘文) primarily for aristocrats and predicted eclipses for the court using the Futian li 符天曆 calendar. 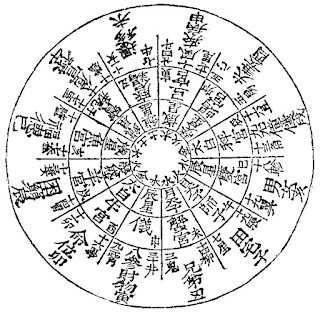 The Xiuyao jing mentions the use of the Indian calendar to determine planetary positions, but no such methods are provided and moreover Hellenistic astrology is largely absent in the text (such as the natal chart and aspect or the angles which planets make relative to one another on a chart). The Futian li was a popular calendar (i.e., not officially published by the state) compiled by Cao Shiwei 曹士蒍 (d.u.) in the Jianzhong 建中 period (780–783) of the Tang dynasty, known originally even in pre-modern times as having been based on Indian calendrical methods. This is reported in the history of post-Tang kingdoms preceding the Song dynasty – the Xin wudai shi 新五代史 (fasc. 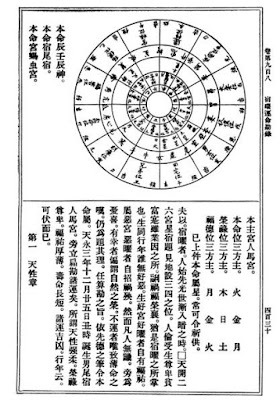 58) – which further states its starting point is year 5 of reign era Xianqing 顯慶 (660 CE).1 This start date incidentally is necessary in order to understand Sukuyō horoscopes as they state the number of days elapsed since then (積日數). For example, the Sukuyō unmei kanmon 宿曜運命勘文, a horoscope for an individual born on lunar 12/25 in Ten'ei 天永 3 (1113) states that 165,428 days have elapsed: 165,428 ÷ 365 = 453; 660 + 453 = 1113. It seems the calendar initially did not account for the Indian 'hidden' or pseudo-planets Rāhu and Ketu. In Indian astronomy Rāhu is generally the ascending node of the moon, whereas Ketu is supposed to be the descending node, but it can also possibly function as the moon's lunar apogee (Skt. ucca). This is a native Indian model, though Rāhu originally in Vedic literature was the demon who devoured the moon. By the Tang dynasty, many Chinese intellectuals, both in Buddhism and the astronomy community, were taking an interest in Indian astronomy, which was introduced initially with works like the Navagraha 九執曆 by Gautama Siddhārtha.2 Song Lian 宋濂 (1310–1381) in the Luming bian 祿命辨 reports that early in the Zhenyuan era 貞元 (785–805) after production of ephemerides for the eleven planets3 by Li Biqian 李弼乾 (otherwise Li Miqian 李彌乾), Cao Shiwei additionally calculated ephemerides for Rāhu and Ketu starting from year 1 of Yuanhe 元和 (806). This was also around when the Duli yusi jing 都利聿斯經 was also translated (785–805), which is not extant apart from fragments. The title possibly stands for 'Dorotheus' and perhaps is related to Dorotheus' Carmen Astrologicum (see Bill Mak 2014). Mak also suggests it was possibly Syrian Christians in Chang'an who translated the work, but some fragments of the work and remarks concerning it in Chinese histories suggest distinctly Indian elements like Rāhu and Ketu, though these might reflect developments in China following the translation of the original text. 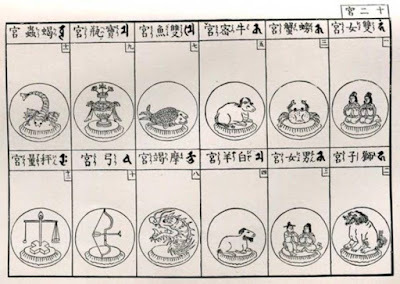 Again, it seems that Cao Shiwei's calendar initially did not account for Rāhu and Ketu, but this newly introduced occidental astrology required it, especially for casting Indian-style horoscopes which became increasingly popular in China, and thus the Zhizhai shulu jieti 直齋書錄解題 (fasc. 12) also records a specific work entitled Luoji er yinyao licheng li 羅計二隱曜立成歷 (an ephemeris for Rāhu and Ketu) by Cao Shiwei, noting the start date. Table in the Qiyao rangzai jue. Note the 12 places (domus). 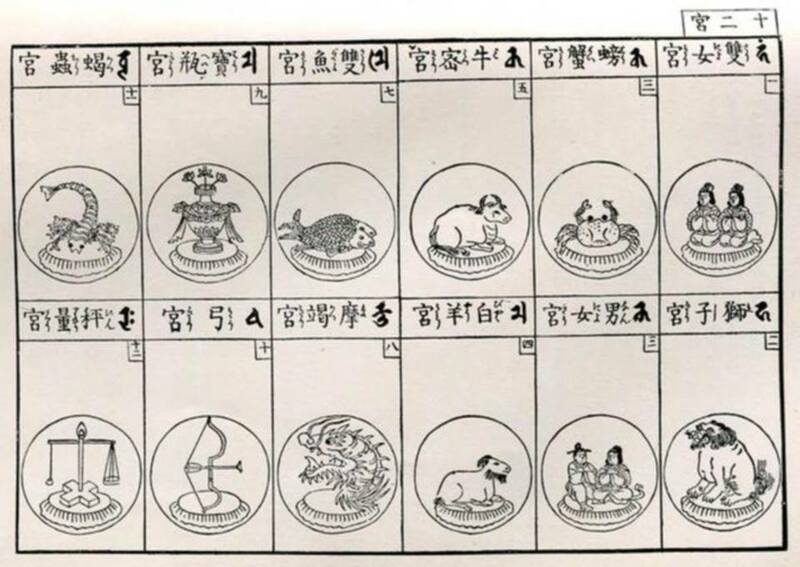 This possibly explains why the Buddhist Qiyao rangzai jue 七曜攘災決 (T 1308), an ephemeris for the planets accompanying astrological lore and planetary mantras, has a separate starting date for Rāhu and Ketu: the calendar therein commences from 794 for the five visible planets, and 806 for Rāhu and Ketu (Yano 2013: 174–185 and Yabuuchi 1982: 5–6). It might be noted here that Buddhists in China were clearly free to make use of foreign materials translated by Christians! It is to be recalled that Amoghavajra's Xiuyao jing only mentioned calendars and the need to identify planetary positions, but provided no means of doing so. Four or five decades later it was men like Cao Shiwei who allowed the Chinese to easily determine planetary positions for any date in order to practice advanced astrology and draw up horoscopes. One should also bear in mind that the early Tang legal codes expressly forbid the private study of astronomy, calendrical science and certain forms of divination, but following the breakdown of central state authority after the An Lushan rebellion (755–763), people were evidently free to produce such materials and even sell them at the marketplace, especially with the widespread development of woodblock printing. One might imagine in the ninth century mass-produced manuals for drawing up natal charts on sale, not unlike what is available today at any common bookshop. Again, the Sukuyō-dō in Japan primarily used Cao Shiwei's Futian li and lore obtained through various texts to practice their art. It was the Japanese monk Shū'ei 宗叡 (809–884) who brought the aforementioned Duli yusi jing to Japan in 865. Although the Futian li was available in Japan when the Nihonkoku kenzai sho mokuroku日本國見在書目錄 was compiled by Fujiwara no Sukeyo 藤原佐世 (d. 897) in c.891 (listed as 唐七曜符天曆一 under the 天文家 heading),4 in 953 the monk Nichi'en日延 (d.u.) at the request of the onmyōji 陰陽師 (Onmyō-dō master) Kamo no Yasunori 賀茂保憲 (917–977) was ordered to fetch a new calendar, whereupon in the state of Wuyue吳越 he studied and retrieved a version of the Futian li, which he brought back in 957. It was as much about the text as it was about someone possessing the necessary knowledge and expertise to employ it. Nichi'en was chosen for this role because he was disciple of Tendai monk Ninkan 仁觀 (d. 934), who had a background in calendrical science. The Futian li was used alongside the Senmyō reki 宣明曆 by calendar experts (not unlike in China until the Mongol period 1271–1368), whom the Sukuyō-dō debated with in particular with respect to eclipse predictions until the end of the Kamakura period (1185–1333). The Sukuyō-dō participated in official calendar production from 995 when Ninsō 仁宗 was ordered to assist. This participation ended in 1038. This is noteworthy because it highlights how some Buddhist monks in the Heian period were able to successfully participate in 'secular science', at least for a brief time. The origins of the Sukuyō-dō lineage itself are traced back to a need for an accurate astrological schedule for Mikkyō 密教 rites (Tendai and Shingon), which are rooted in key scriptures of the tradition such as the Mahāvairocana-sūtra (otherwise a tantra) (T 848; translated in 724). In the second chapter it insists the drawing of the maṇḍala is to be done on an auspicious day 良日, the immediate definition of which was only briefly covered in the text's Chinese commentary, the Dari jing shu 大日經疏 (T 1796) by the eminent astronomer-monk Yixing 一行 (683–727), who also helped to translate the sūtra. Amoghavajra's Xiuyao jing provided a comprehensive astrological schedule for these rites. It was brought to Japan by Kūkai 空海 (774–835) in 806 and again by Ennin 圓仁 (794–864) in 847 and Enchin 圓珍 (814–891) in 858.5 Kūkai was insistent on the new art being implemented (see here). Such knowledge required specialization and this led to the appearance of 'astrologer monks', such as Ninkan, who in 926 set the date for a major rite (see Teishin kōki shō 貞信公記抄). Likewise in this century there were star worship rites for the Tennō 天皇 (Japanese Emperor), which required ascertaining his birth day 本命日and birth constellation 本命宿. In 961 for the Murakami Tennō 村上天皇 (926–967; r. 946–967) the monk Hōzō 法藏 (905–969) debated with Kamo no Yasunori over this, highlighting the early division between Sukuyō-dō and Onmyō-dō and increasing faith in star worship. Said rites along with horoscopes subsequently became widely done for the aristocracy from the late tenth century onward. There are also many examples of Sukuyō-dō monks performing rites when eclipses occurred. Other rites were heavily Daoist in nature, such as those for the Big Dipper 北斗法 aimed at extending longevity 延命 (originally a native Chinese practice), which became prominent in the late Heian period. Hōzō, who had also probably studied the Futian li, later on was designated as the first sukuyō-shi. The earliest datable appearances of terms Sukuyō-dō and sukuyō-shi in journals of aristocrats are from the beginning to the mid-eleventh century (Toda 2007), though sukuyōdōhō 宿曜道法 ('methods of Sukuyō-dō') appears in a citation of Hōzō's debate recorded in the Ono rui hishō 小野類祕鈔 by Kanshin 寬信 (1084–1153). Therefore although Kūkai first introduced occidental astrology into Japan, he was not regarded as an astrologer and certainly not a sukuyō-shi. Hōzō 法藏, Rigen 利源(原), Ninsō 仁宗, Ninso 仁祚, Nintō 仁統, Fusen 扶宣, Chūin 忠允, Ryōtan 良湛, Zōmyō 增命, Shōshō 證昭, Genso 彥祚, Nōsan 能算, Shōshō (靜)淸昭, Gōshun (桓)恆舜, Kokkū 國空, Songen 尊源, Kensen 賢暹, Kyōzō 慶增, Ryōyū 良祐, Myōsan 明算, Shinsan 深算, Nichikaku 日覺. It also lists the following rokumyōshi 祿命師 (specialists of Chinese luming 祿命 divination) with four in common: Nichi'en 日延, Fusen 扶宣, Ryōtan 良湛, Nōsan 能算, Chūshō 忠淸, and Kyōzō 慶增. Although several of these monks were from the Tō-ji 東寺 and Taimitsu 台密 (Tendai Mikkyō) lineages, from the mid-Heian period sukuyōshi primarily came from Kōfuku-ji 興福寺 (Hossō school 法相宗), the first known of which is Ninsō (b.945?). The journal of Fujiwara Sanesuke 藤原實資 (957–1046), the Shōyūki 小右記, reports in 982 (Tengen 天元 5) his monastic affiliation and him being ordered to compile an astrology report. It is noteworthy here that Kōyasan, so far as I have read, never seems to have hosted such astrologer monks. 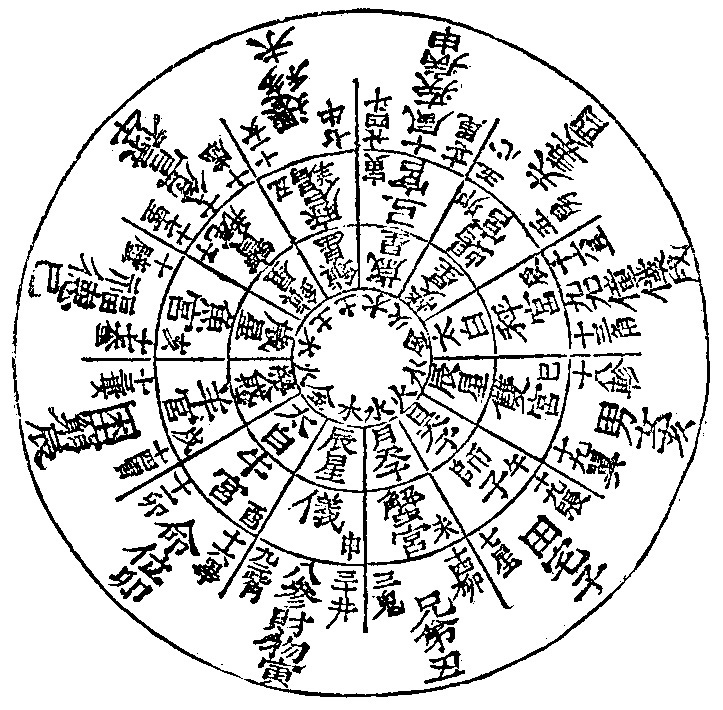 The Xiuyao jing is cited frequently in extant Mikkyō literature as it provided the necessary astrological schedule for rites. However, casting horoscopes – primarily for aristocrats – was perhaps not of interest to them. Later two mainstream lineages emerged and remained active in the Kamakura period: the Chin-ryū 珍流 (variant: 珎流) and San-ryū 算流. Many such names are recorded in the Sonpi bunmyaku 尊卑分脈 compiled by Tōin Kinsada 洞院公定 (1340–1399) in 1376. In the Insei period 院政期, two prominent sukuyō-shi were Chinga 珍賀 and Kyōsan 慶算. By the Kamakura period Sukuyō-dō had spread to the city of Kamakura and transitioned from primarily casting horoscopes to being ritual specialists (see Toda 2006, 2007). Other noted sukuyō-shi include Shōichi 性一, Kenichi 兼一, En'ichi 圓一, Gien 義圓, and Ninken 任憲. Sukuyōdō as an identifiable community vanished in the fourteenth century. The Shosaimon kojitsushō 諸祭文故實抄 (final compilation in 1518 by Higashibōjō Kazunaga 東坊城和長 1460–1530) lists eight Sukuyō-dō rites that were temporarily revised and carried out in the Ōei 應永 period (1399–1427) between 1394–1413. The final symbolic blow to the destruction of the tradition was when the Hokudokōrin-in 北斗降臨院 at Kiyomizudera 淸水寺 (built in 1165 by Chinga; see the Enjōji denki 園城寺傳記・九之十) burned down in 1417 as recorded in the Kanmon gyoki 看聞御記 (the journal of Fushiminomiya Sadafusa 伏見宮貞成 for the years 1416–1448). The demise of the Sukuyō-dō was also largely tied in with the collapse of aristocratic power as warlordism took hold of Japan. The chaos and strife did not really settle down until the Edo period in the seventeenth century under the Tokugawa 徳川 regime. However, by that time the old astrologer monks of centuries past no longer existed and their manuals had probably been largely lost by then. My study of the Sukuyō-dō has been especially fruitful in helping to shape an understanding of Buddhist astrology in China, especially because they practiced and documented a practice of astrology that was directly carried over from the mainland. As is often the case in the study of medieval Chinese Buddhism, one must rely on Japanese sources as much was lost following the collapse of the Tang dynasty in the early tenth century, to say nothing of the subsequent rise and fall of the Song. It is worth mentioning that in the twentieth century numerous popular works on 'Sukuyō Astrology' 宿曜占星術 were published in Japan, though these focus chiefly on popular and unscholarly interpretations of the Xiuyao jing. Komine Yumiko 小峰有美子 (b. 1930) claims to have inherited a secret oral lineage from Iseki Tenkai 井關天海 representing the Sukuyō-dō lineage (Komine 1982). It is not impossible that someone could have received teachings on the text as Kōyasan scholars even in the Edo period studied the text and their authoritative version of the text compiled by Kakushō in 1736 was printed for the first time by Wakita Bunshō 脇田文紹 in 1897. However, one will recall that the original Sukuyō-dō lineage was based primarily on other texts and they were skilled in casting horoscopes, an art which the Xiuyao jing does not teach nor even allude to. Therefore any claim of a secret surviving Sukuyō-dō lineage should show awareness of all the other texts relevant to the original tradition, but this seems to have escaped enthusiasts in the twentieth century. Now in Japan there are many works on 'Sukuyō Astrology' available for sale, but these are popular works that take great liberties with the terse language of Amoghavajra's work. Mak, Bill. "Yusi Jing - A treatise of 'Western' Astral Science in Chinese and its versified version Xitian yusi jing*," SCIAMVS 15 (2014): 105-169. Momo, Hiroyuki 桃裕行. “Nichi'en no Tenfu reki seirai.” 日延の天符曆齎來. In In Ritsuryō kokka to kizoku shakai. 律令國家と貴族社會, ed. Takeuchi Rizō 竹內理三, 395–420. Tokyo: Yoshikawa Kōbunkan 吉川弘文館, 1969. Momo, Hiroyuki 桃裕行. “Sukuyōdō to sukuyō kanmon.” 宿曜道と宿曜勘文. In Risshō shigaku. 立正史學 39 (1975): 1–20. Murayama, Shūichi 村山修一. Nihon Onmyōdō shi sōsetsu. 日本陰陽道史總說. Tokyo: Hanawa Shobō 塙書房, 1981. Toda, Yusuke 戶田 雄介. “Kamakura bakufu no sukuyōshi: toku ni chinyo ni tsuite.” 鎌倉幕府の宿曜師 : 特に珍譽について. In Bukkyō Daigaku daigakuin kiyō. 佛教大學大學院紀要 35 (2007): 45–59. Toda, Yusuke 戶田雄介. “Sukuyōdō saiki ni tsuite no ichi kōsatsu: hokuto hon haiku to hokuto hō.” 宿曜道祭祀についての一考察 : 北斗本拜供と北斗法. In Bukkyō Daigaku daigakuin kiyō. 佛教大學大學院紀要 36 (2008): 33–48. Yabuuchi, Kiyoshi. “Tō Sō Shii no Futenreki ni tsuite.” 唐曹士蔿の符天曆について. In Biburia Tenri Toshokan hō. ビブリア 天理圖書館報 78 (1982): 2–18. Yabuuchi, Kiyoshi. Chūgoku no Tenmon Rekihō. 中國の天文曆法. Tokyo: Heibonsha, 1990. Yabuuchi, Kiyoshi. Zōtei Zuitō rekihō shi no kenkyū. 增訂隋唐曆法史の硏究. Kyoto: Rinsen Shoten 臨川書店, 1989. Yamashita, Katsuaki 山下克明. “Heian jidai ni okeru mikkyō seishinku no seiritsu to dōkyō.” 平安時代における密教星辰供の成立と道教. In Nihonshi kenkyū. 日本史硏究 312 (1988): 37–61. Yamashita, Katsuaki 山下克明. Heian jidai no shūkyō bunka to onyōdō. 平安時代の宗教文化と陰陽道. Iwata Shoin 岩田書院, 1996. Yajima, Genryō 矢嶋玄亮. Nihonkoku genzai sho mokuroku: shūshō to kenkyū. 日本國見在書目錄 : 集證と硏究. Tokyo: Kyuko Shoin 汲古書院, 1984. 1 This is close to the starting point of the Navagraha 九執曆: year 2 of Xianqing (657) (see Yabuuchi translation 1989). The Futian li establishes the solar year 回歸年 as 365 days + 2448/10000 days. It was initially only in popular, not official, use until it was named the Tiaoyun li 調元歷 (or it was otherwise based on the Futian li) and employed for five years under the Later Jin 後晉 (936–946) between 939–944 (see also Liao shi 遼史, fasc. 42). This is echoed by the Kunxue jiwen 困學紀聞 (fasc. 09) which also notes Wang Pu 王樸 in the Later Zhou 後周 (951–960) abolished study of the Futian li. The Song shi 宋史 (fasc. 207) and Chongwen zongmu 崇文總目 (fasc. 4) list it and a few related works. See also the additional remarks in the Yu hai 玉海 (fasc. 10). The alternate title He yuan wanfen li 合元萬分歷 is noted in the Junzhai dushu zhi 郡齋讀書誌 (fasc. 13). The Yuan 元 period (1279–1368) Mishu jianzhi 祕書監志 (under 二夕軒八斤入兩) reports the Futian li and the Xuanming li 宣明曆 as texts to be studied and examined, demonstrating that the calendar was actively studied until this period. Both calendars were also jointly consulted in Japan. 2 Indian astronomy text with Greek influences translated into Chinese by imperial decree in 718. Included as fasc. 104 in the Da Tang Kaiyuan zhan jing 大唐開元占經. It is mainly based on the Pañcasiddhāntikā. However, the tabulated latitude value of 35 is for Chang'an 長安, not India (see Yabuuchi chap. 11, 35), indicating modification for localization. It is not a comprehensive siddhānta text, but rather a karaṇa text providing calculation methods. It details siddhānta algorithms, a dot for zero, a table of sine functions and methods for eclipse prediction superior to those developed in China. A number of terms were adopted directly from Sanskrit equivalents. The work demonstrates Chinese interest in foreign science in the Tang. Access was presumably restricted and it was lost until rediscovered in a Buddha statue around 1600 by Cheng Mingshan 程明善. For a full English translation and detailed study see Yabuuchi Kiyoshi (1989). 3 In addition to the five visible planets, the sun, moon, Rāhu and Ketu, there are two other mysterious hidden planets: Ziqi 紫氣 and Yuebei 月孛 / Yuebo 月勃. 4 The oldest extant catalog of Chinese texts 漢籍 in Japan, listing 1579 works. Compiled by Fujiwara no Sukeyo 藤原佐世 (d. 897) in c.891. 1 fasc. It follows the format of the Jingji zhi 經籍志 of the Sui shu 隋書, listing numerous texts not found in the Tang shu 唐書, making it an important historical source. Also called Nihon genzai sho mokuroku 日本見在書目錄, Honchō genzai sho mokuroku 本朝見在書目錄, Sukeyo roku 佐世錄, Fujiwara no sukeyo chūmon 藤原佐世注文. The oldest version is at Murōji 室生寺. 5 The Taishō version of this text is an edited mainland version different from original Japanese manuscripts which Kakushō 覺勝 used for his authoritative version published in 1736 (for an extensive study see Yano 2013). Sukuyō-dō most likely exclusively used the latter textual lineage.